But it wasn't until Friday afternoon when the No. 1 boys cross country team in the country was left truly frustrated, as a last-ditch effort to pivot to an out-of-state meet in Ohio was denied after a national sanction wasn't completed in the final moments before the school's internal deadline. A process that typically takes at least 60 days was balled into a 72-hour pitch as the Boardman Invitational forwarded an application for an emergency sanction straight to the National Federation of High School Associations. Ultimately, a few signatures could not complete the deal. Loudoun Valley is just one of many teams in Virginia, North Carolina and South Carolina that have been impacted by the Category 1 storm--some in lesser or larger degrees than others. "We were trying to get a complicated sanction done in a very short amount of time," said Dave Pavlansky, who was the Boardman (OH) High School coach who worked on the deal. Loudoun Valley pulled its runners out of class on Friday in anticipation of the sanction being completed. That decision was made to get a head start on the four and a half hour trip to Youngstown, Ohio. Ideally, the team had also hoped to get a run-out on the course and make dinner plans that night. But the program was left disappointed by the end result. "Until we knew we needed an NFHS sanction on Wednesday, it seemed like it would be impossible to get," Pavlansky said. "Although, if we would have had 24 more hours to try to communicate to them, in terms of the unusual request to waive all their deadlines and applications, I think we could have made it work." Originally, the Vikings were scheduled to compete at the Oatlands Invitational on Saturday in Leesburg, though precaution for rain and muddy conditions on the Oatlands Plantation Course rerouted the event's plans for one of Virginia's most talented regular season meets. Along with Oatlands, another high-profile meet in North Carolina, the adidas XC Challenge, was cancelled. But the Vikings were fortunate that by Wednesday they knew their situation was changing. By then, the program had switched course, entering the nation's top boys team in the varsity meet at the Boardman Invitational in Youngstown--which was just a stone's throw away from where head coach Marc Hunter grew up. Normally in a case that involves interstate competition, jointly-involved state associations work together to sanction out-of-state teams for competition. That sanction is significant for a lot of reasons, but the most important factors are appropriate insurance coverage and eligibility. In this case, had late entries come from a team in Pennsylvania, West Virginia or Michigan, there likely would have been little problem, Pavlansky said. But the meet had never welcomed a program from Virginia, and the NFHS stepped in and required signatures. At the risk of running without a sanction, the Vikings could have jeopardized eligibility down the road, Pavlansky said. 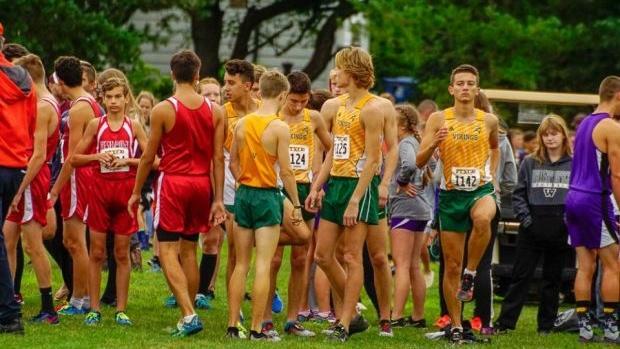 The Loudoun Valley boys, which are coming off an impressive debut at PTXC10, will return to action on Sept. 22 at home at the Loudoun Valley Championships.